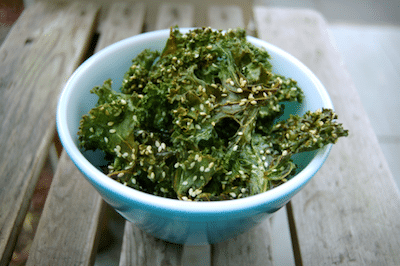 If you’re searching for “caveman diet recipes”, you’ll love this quick and simple Kale chip recipe. Kale is a superfood which benefits overall health and it’s definitely compatible with the Paleo diet. If you’re on a Paleo diet weight loss plan, adding our tasty Kale chips to your weekly menu plan will help you to slim down and feel great. In addition, since this recipe requires only three ingredients, you’ll find that it doesn’t take a bite out of your budget. When you’re putting together your next Paleo diet grocery list, just add Kale, olive oil and salt. You probably have olive oil and salt in your home kitchen already! Once you’ve gathered your ingredients, you’ll be ready to prepare this satisfying and nutritious snack. First, make sure that your oven is pre-heated to three hundred degrees. Then, take the center stems out of the Kale and shred it into smaller pieces. Once you’ve done so, add two tablespoons of olive oil to the kale and toss is as you would toss dressing and salad. At this point, you may add some salt if you prefer to. Lastly, place the Kale on a baking sheet – you’ll need to bake it for fifteen minutes, until it’s crispy. Once your Kale chips are done, put them in a bowl and enjoy right away! They’ll make a great, Paleo-friendly snack which is healthy and all-natural. Staying away from processed foods is a big part of sticking to this diet and you’ll discover that Kale chips are really tasty. In fact, some health-conscious celebrities, such as Cameron Diaz, enjoy Kale chips daily. They know that Kale has beneficial properties, due to its vitamin A, vitamin C and vitamin K content. Kale is also fortified with minerals, so it’s a treasure trove of vital nutrition. There are lots of other Paleo snack recipes out there. However, few will be as easy to prepare as this one. For this reason, we do recommend that you try this recipe today. It takes just three ingredients, two of which are commonplace in most kitchens, and it tastes really good. Perfect for solo snacking or to share with family and friends, Kale chips are a trendy, yet timeless. The more Paleo-friendly diet recipes you collect, the better. These recipes will help you to get more benefits from your Paleo diet plan.